A new Apple patent application published today by the US Patent & Trademark Office (USPTO) suggests the company is looking to extend Apple Watch activities and monitoring to include cycling, Patently Apple reports. The filing titled “Calculating an Estimate of Wind Resistance Experienced by a Cyclist” details improved techniques and systems for determining and monitoring cycling data. Apple explains that by monitoring data using the wearable device, improved estimates can be derived for various factors contributing to the resistance experienced by the user in the course of the activity. Using these improved estimates, data sampling rates may be reduced for some or all of the monitored data. Apple’s invention relates generally to determining estimates for the resistances experienced by a cyclist and thus the total power output of the cyclist. 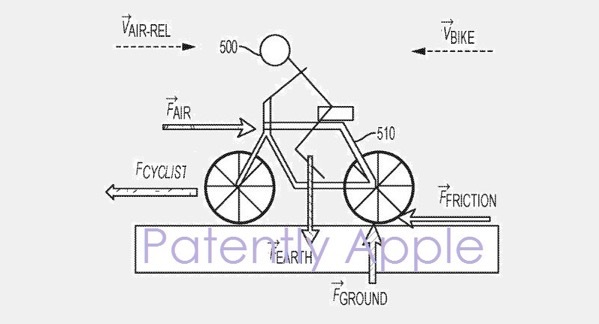 The invention may include a wearable device such as an Apple Watch and techniques for estimating total power output and/or the contribution of wind resistance to the total power output of a cyclist wearing the wearable device. The watch may include one or more microprocessors, a display, and a variety of sensors, such as a heart rate sensor and one or more motion sensors. The wearable device can include a heart rate sensor to provide a series of measurements of cyclist heart rate. The wearable device can also include motion sensors to collect data about the wearable device’s position and orientation in space and to track changes to the wearable device’s position and orientation over time. Apple’s patent application was first filed for in Q3 2016. For more details, hit up the source link.